Members of the Wisconsin Elections Commission are standing behind embattled members of the agency’s staff. Commission Chair Mark Thomsen proposed a resolution Tuesday re-affirming support for the agency’s interim administrator, Michael Haas, who was named in a Department of Justice report into the leak of information from a secret John Doe investigation that targeted Governor Scott Walker’s campaign and conservative groups. 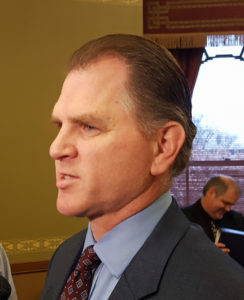 While Haas was not on the list of former Government Accountability Board staff members who the attorney general has suggested should face contempt charges, state Senator Steve Nass (R-Whitewater) has called for his resignation in the wake of the report. “We rely and trust in Mr. Haas’ decisions,” Thomsen said. The resolution, which was unanimously approved by commissioners, also asks for the governor to appoint an attorney to represent the agency. Following the vote, Thomsen also expressed support for Elections attorney Nathan Judnic, who was among those recommended to face contempt proceedings and who Nass has also asked to resign. “Everything I’ve seen him do to date is with integrity and in the interest of the voters,” he said. The action by the commission comes just hours after the Wisconsin Ethics Commission released a letter rebutting the report released by DOJ last week. Members of that panel argued there were inaccuracies and omissions in the report, and called on the attorney general to address those. Attorney General Brad Schimel fired back in a letter released late Tuesday afternoon, which said the DOJ is standing by its report. Schimel argued that the Ethics panel failed to actually show anything was inaccurate – members just disagreed with how events were portrayed.